This is a luxury self-catering campsite that is laid out in a horse shoe shape against the side of a dune. The camp overlooks one of our watering holes, where animals can frequently be spotted. The campsite consists of two cabins for guests. 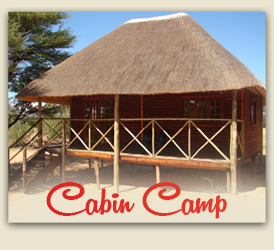 The one cabin has 4 single beds, while the other cabin has a double bed with two single beds. Each Cabin has its own outdoor bathroom built specifically and uniquely to allow our guests to enjoy nature while enjoying a hot shower. The hot water comes from a boiler in which a fire is made, also known as a donkey. The luxury kitchen is fully equipped with a stove, fridge and freezer, but more importantly, boasts with a wall to wall window overlooking the watering hole - being in a kitchen has never been so scenic. Next to the kitchen is a lapa that guests can use as a venue for meals, or just relax in. In the center of the horse shoe, is the braai (barbeque) area. Many hunting stories have been told around this fireplace. The stars are always spectacular from around the fire, snuggled in silence, apart from animal noises. To ensure the unspoiled nature of our farm, all the facilities are equipped with solar power.